Miraculously, last night we slept in a developed campground. Clover Meadow Station, nearly 3 miles down an unpaved road. The trip was worth it. Ah the luxuries of running water and pit toilets! 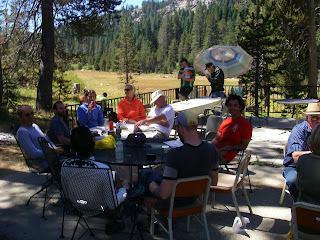 We are at around 7000 feet and from here it's all rolling and downhill to Bass Lake (exception: one 2-mile climb). The road surface proves to be not bad, not bad at all! Quite doable, really. Mostly it is packed dirt, sometimes with a swath of old pavement to ride on. When cars pass, the fine dust kicked up by their wheels is something to avoid. The drivers are mostly cautious and friendly. About halfway through the unpaved section, Portuguese Overlook. This spot looks south toward Shuteye Ridge, which we followed yesterday (on the far side). And in the other direction, some fabulous granite rock formations that look old, with folded worn edges. They keep watch over the vista point as well as the valley and ridge in the distance. 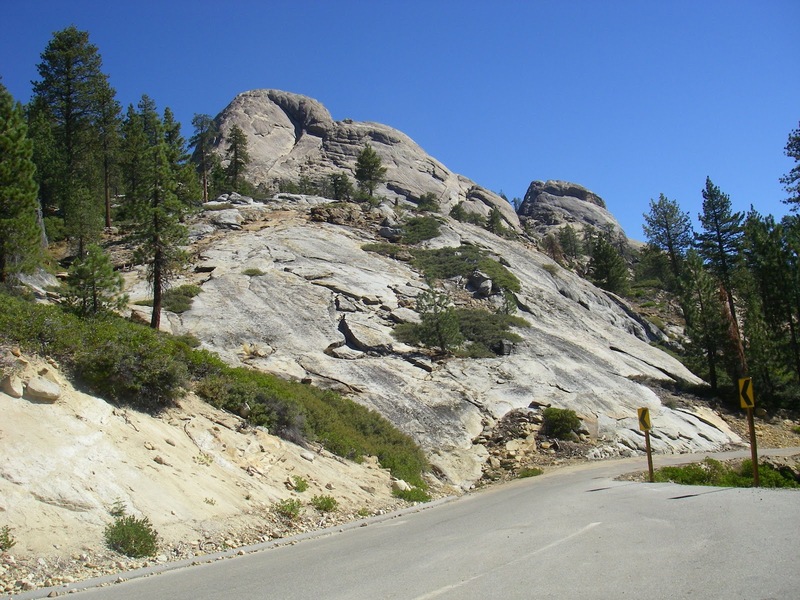 View north, alpine rock formations. 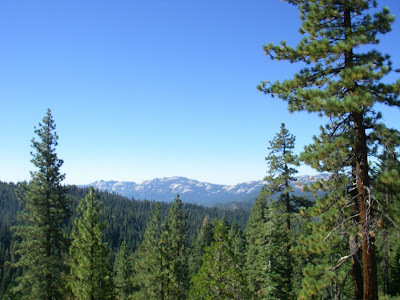 View south, subalpine valley and Shuteye Ridge. The information sign says we are following the boundary between sub-alpine and alpine climate zones. To the right, rocky terrain with sparse shrubs; to the left, a dense fir forest. Steep hillsides in the forest make for strong thermal currents, an ideal environment for raptors. Thermals let them hunt longer and more efficiently. This topography is also ideal for drawing snow. Next month snow will start to fall and the amount will not be trivial. I enjoy the warmth on my shoulders a little more, knowing it is temporary. In the alpine zone the air is light, the sun intense. Flashing from the right a bird coasts low and fast across the road. Toward the forested hillsides. Dark grey color. Confident, looking forward. Raptor. Peregrine falcon, maybe. It's shaping up to be a lovely ride. As the surface improves and becomes pavement again, the bike picks up speed. Especially downhill, the weight of the panniers make the bike go fast. This presents a sightseeing challenge! It's more dangerous now to look around and harder to stop. Globe Rock is definitely worth the effort of both those things. It's visible from the road but looks so extra-terrestrial that a short hike is in order. What water can do, by freezing and thawing. Many years ago the Mono people ground acorns here. The grinding holes remain, small deep dents in the granite. 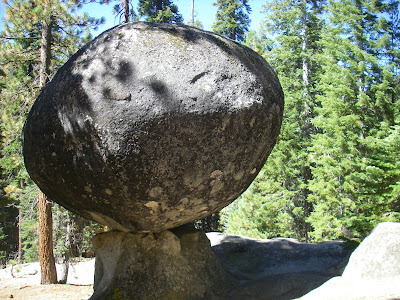 Did they say to each other, "meet you at the big round rock on a pedestal"? Wonder what that sounded like in their language? 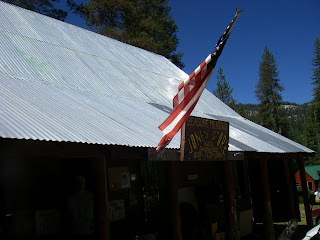 Jones Store, packed with tourists. Several miles down the road, an unmistakeable scent: hamburgers cooking. Are hamburgers an indigenous food? Does anyone care at this point? 11:30, empty stomach, animal instincts say "stop". Every human within 20 miles is here! They have 3 people in the kitchen and still it takes 45 minutes to get a huge, delicious burger. We're not back in the city yet. I'm OK with that. The burger enables the 2-mile climb to Coldsprings Summit. 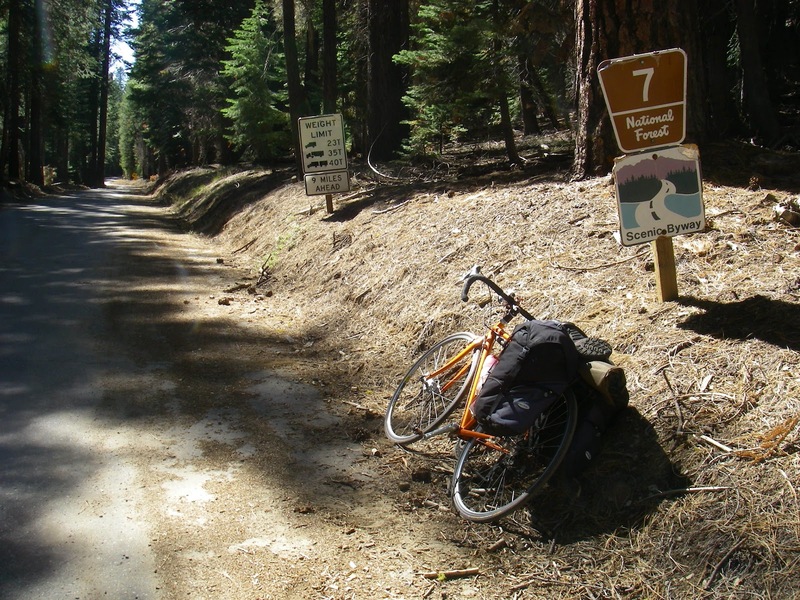 Skipping the detour to Fresno Dome enables a 10-mile screaming descent and runaway bike. A screeching, white-knuckled stop at the shoreline of Bass Lake. A tourist day in a tourist destination! At the lake the Labor Day holiday-makers have their ice chests, lawn chairs, umbrellas, boats, and who knows what else. I am completely, utterly, blissfully happy with a shower (yes, with soap).